Jack's Photo & Travelblog: Pont du Gard - Oh.. those Romans..
Pont du Gard - Oh.. those Romans.. The best time to visit one of France most popular tourist spots must be in February. Being almost alone, taking time to study the place and the details of this facinating 2.000 year old structure. Just klick here for a Flickr set of photos from the famous place..
Pont du Gard, Roman aqueduct across the Gard River, Gard dept., S France. Built in 19 B.C. 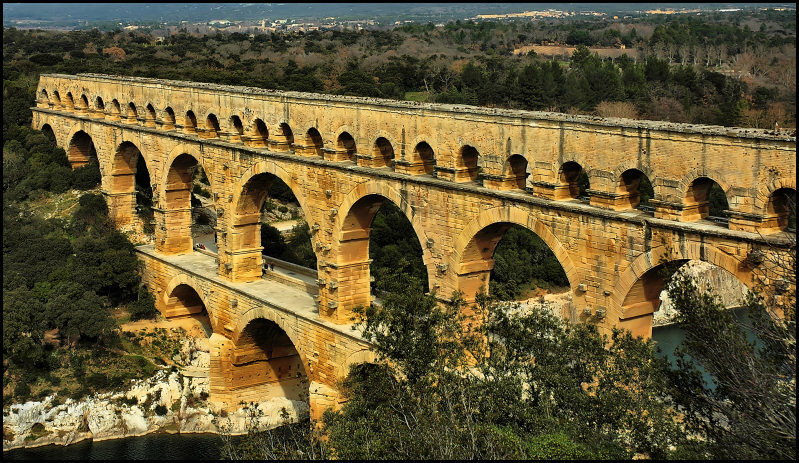 to supply Nîmes with water, it consists of three tiers of arches and is c.900 ft (270 m) long and c.160 ft (50 m) high. This famous construction is admired for its architectural proportions. The lowest tier is now used as a road bridge. It was constructed entirely without the use of mortar. The aqueduct's stones – some of which weigh up to 6 tons – are held together with iron clamps. The masonry was lifted into place by block and tackle with a massive human-powered treadmill providing the power for the winch. A complex scaffold was erected to support the aqueduct as it was being built. The face of the aqueduct still bears the mark of its construction, in the form of protruding scaffolding supports and ridges on the piers which supported the semicircular wooden frames on which the arches were constructed. It is believed to have taken about three years to build, employing between 800 and 1,000 workers. The Pont du Gard is today one of France's top 5 tourist attractions, with 1.4 million visitors.